Which products are you seeking for? I have any sort of products from Firmenich, IFF etc. Hi, Andrea thank you for answering me. I am kind new for perfumery and this is an hobby of mine that i really love , As fresh apprentice I did some perfumes with natural essence ,some good some very bed but i could never reach the sophisticate notes that you can feel in the commercial fragrances and that is why i am try to get the isolates and molecules like aldehydes , iso e super , habanolide, etc.I live in Miami,Fl .an it’s kind hard to find this products unless you research the internet i did find several sites and in which one of them i found yours, with a lot of informations ( very well made).So i will like to know if you can sale me small quantities like 80 ml .If you cannot thank you anyway .Kind regards Alessandro. I answered you in pvt message. Do you have any recommendations for a papery/dusty isolate? Brand new to this, and all I want is to smell like a library! TIA! Thank you for commenting. 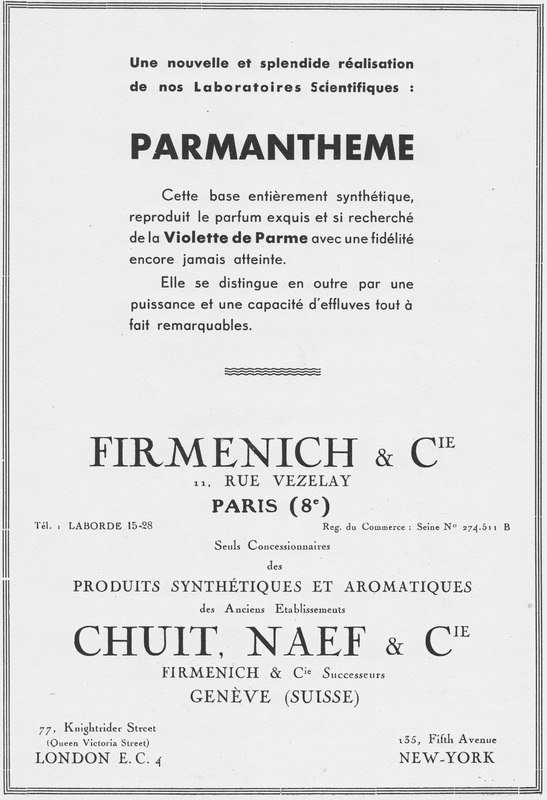 I think you should try Vetyrisia (Firmenich), a beautiful orris-vetiver base which features ionones, powdery, cardboard-like notes (similar to Chanel N19). There is also orris butter, indeed, and amyris oil: sawdusty, cardboard-like. Between the different vetiver qualities, the one from Haiti is the most dry, papery. Gentiana absolute should also be quite interesting in small amounts for its powdery, earthy, fresh paint-like, fatty, leathery, tobacco notes. Thinking about synthetics, I recommend you to work on acids which, generally speaking, have dry, powerful, dusty, sometimes fatty notes. Citronellic acid posesses a dusty, dry, rose petal-like, pollen-like character. 9-decenoic acid is more fatty, waxy, truly reminiscent of an unscented candle (not beeswax), or an old soap tablet. I don’t know if orris synthetics could work: Orivone for instance, while possessing a nice dry, orris-like odour is too fatty for a paper accord. Cedrol and cedryl acetate should be useful. Other interesting synthetics may be ethyl laurate, methyl/ethyl linolenate, ethyl ricinoleate as modifiers. I would start building the accord on an amyris backbone, cedrol, adding traces of citronellic acid, vetyrisia/orris butter, and then play around the products listed above: ethyl laurate, ethyl ricinoleate, 9-decenoic acid, traces of gentiana absolute.